Cost: $30-- I used a fun but expensive print. The cost could be greatly reduced if you buy a cheaper fabric. My apartment is small. 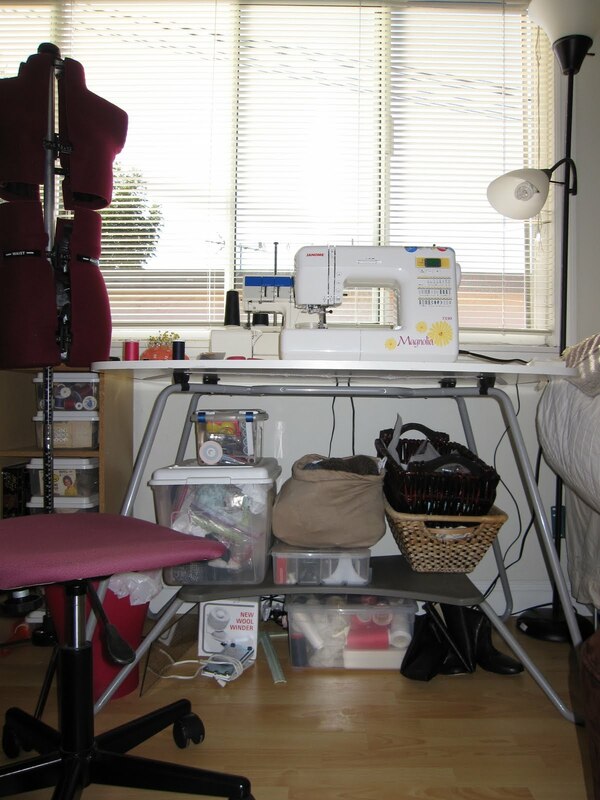 I love it because it's easy to clean, everything is right at hand, and it keeps the junk from piling up. But it also means that I have to maximize storage space while reducing clutter. The trick is to keep a relatively neutral palette that is easy on the eye. 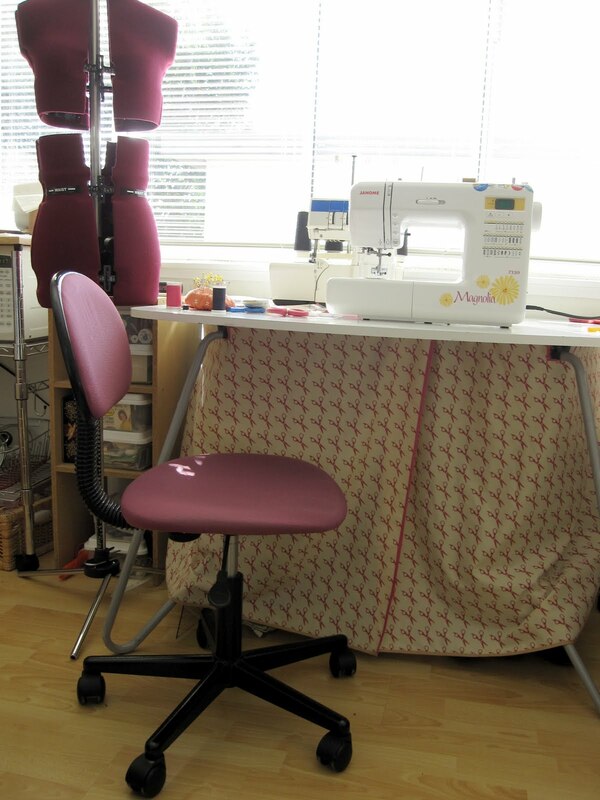 In this vein, I decided to make some sewing-table curtains to hide the accumulating projects underneath. Here's the before and after. I didn't move anything else, just slapped that curtain over it and all ready it looks soo much better! 1. The first thing I did was attach a strip of stick-on velcro to the table where I wanted the curtains to hang from. I then measured, measured, measured and finally cut my fabric, making two panels that wrap around three sides of the table and hang down almost to the floor. 2. I then stuck the corresponding side of velcro onto the selvage of my cut fabric. Using the selvage means that the fabric won't ravel at the edge where the velcro is, so you won't need to finish the edge. I also cut the velcro into smaller strips so that I could have the piece curve slightly around the table. 3. I also cut out a section at the top of each curtain to go around the table legs, which slope outwards. Check out the cute pattern on the fabric! 4. Finally, all that was left to do was finish the edges. As you can see here and in the above pictures, I used pink bias tape to line the edges and the cutout for the table legs, and a more neutral color near the floor. To attach them, I used a Hong Kong seam finish. Very nice, I love this idea! I noticed your dress form(s), too. Tell us about that, please. Hi petunia! The dress form is a "My Double" dress form from Dritz. Overall, it's not the best quality--a little wobbly, not very padded--but I bought it because I have a very small bust measurement and this one adjusted to my size (although I had to play around with it to then make it tall enough for my upper torso).